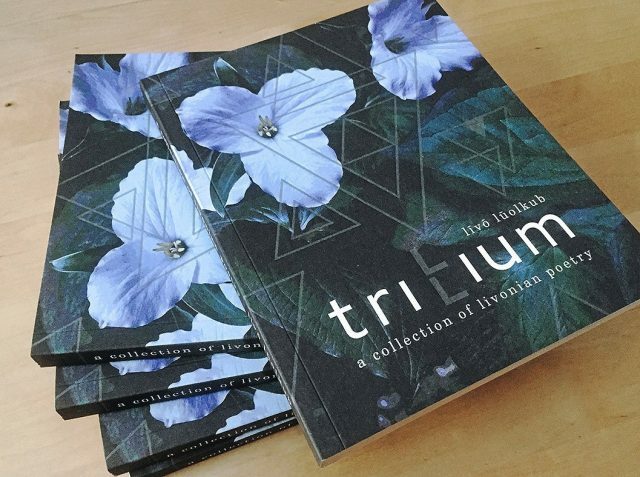 “Trillium”, a bilingual Livonian-English poetry anthology, has just been published containing the poems of Baiba Damberga, Valts Ernštreits, and Ķempi Kārl. This is the first modern Livonian poetry anthology of its kind and its three authors can be considered to be the only ones in the world who write poetry in Livonian at present. Bilingual poetry collection “Trillium”. Picture: Zane Ernštreite. “Trillium” traces the path of Livonian book publishing along its 155-year long journey – from the first book in Livonian (The Gospel of Matthew in the Eastern and Western dialects of Livonian), published in London in 1863, up to the publication of “Trillium” in Rīga, the first ever anthology of Livonian poetry in English, which will be officially unveiled at the Baltic Countries stand at the international London Book Fair in 2018. “Trillium” is being published by Liiviläisten ystävät ry (The International Society of Livonian Friends) and Līvõ Kultūr sidām (The Livonian Culture Centre). Its editor was Valts Ernštreits and its artistic design was created by Zane Ernštreite. The poems were reinterpreted into English by Uldis Balodis and Ryan Van Winkle. The publication of “Trillium” was supported by the platform “Latvian Literature”, the Ministry of Culture of the Republic of Latvia, and the Latvian Writers’ Union. Bilingual poetry collection “Trillium”. Content. Picture: Zane Ernštreite. The authors of this anthology are connected through their Finno-Ugric roots and the language in which they write, though their perspectives on the world are different. Graphic artist Baiba Damberga creates a world revealing the richness of one’s inner light with an eye towards colour and detail (Ku vaimli val min palgõ sūdlõb/When holy light kisses my crown) and one where a salt lake, called by its true name, rains down on the earth along with all of its fish (kõrd vȯļ minā touvõs sūoljōraks/once I was a salt lake coy in the clouds). Linguist Ķempi Kārl, the only one to write in the – some say now vanished – Salaca Livonian language focuses on vanished sounds in both old and new words, and considers their philosophical impact on the lives of individuals and nations alike – when word windows close (Synad läbud/Word Windows), the gate of silence opens (Vaga värded ķäubed/The gate of silence opens). 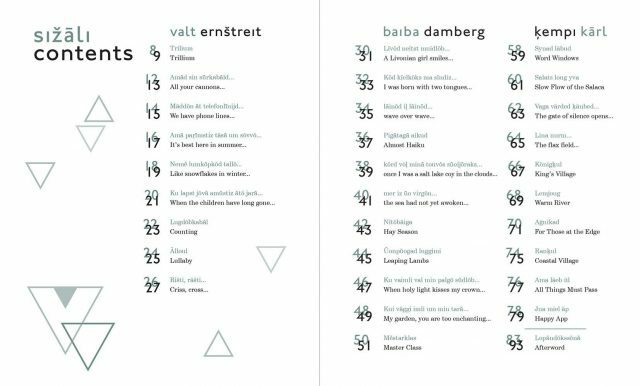 Linguist Valts Ernštreits provides a more rapid and turbulent rhythm – his poems contain airplanes and trams, tanks and submarines, but also a crocheted tablecloth calling up memories (Trilium/Trillium) and a dream of a blue-white boat rocking on a golden sea (Älloul/Lullaby). This anthology is supplemented with an afterword – V. Ernštreits’ overview of Livonian literature. One can only agree with what he writes – it’s possible that Livonian literature is one of the smallest in Europe, but its depths are fathomless. Also today. Bilingual poetry collection “Trillium”. 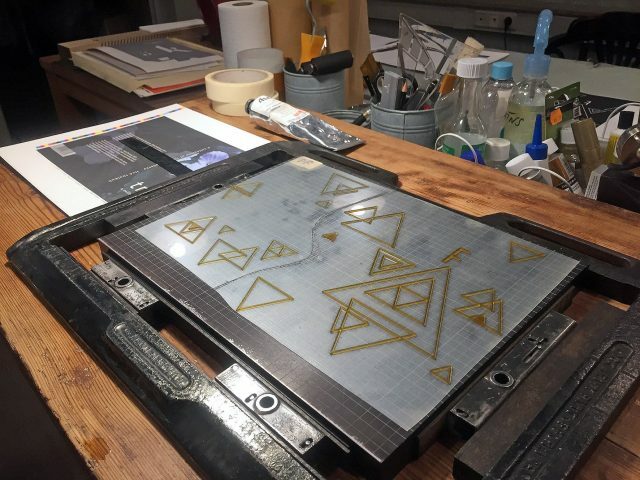 Printing process. Picture: Zane Ernštreite.